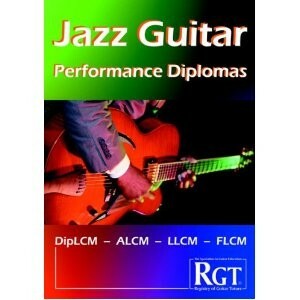 In this article, Merv Young describes the content for each of the RGT Jazz Guitar Performance Diplomas. A few years ago, RGT undertook an extensive review of its Diploma exams. As part of this review, the RGT Jazz Guitar Performance Diplomas were created and launched to universal acclaim from tutors and candidates alike. The Diplomas available are DipLCM, ALCM, LLCM and FLCM and they provide a comprehensive and structured approach that will develop the abilities of any guitarist with an interest in jazz. These Diplomas have been specifically designed with the technical and musical skills and requirements of jazz guitarists in mind. They provide a structured approach that will develop all aspects of jazz guitar playing, as well as enabling and inspiring players to achieve their playing potential. As these are Diploma exams candidates will need to display a standard of playing beyond that expected at Grade Eight. There is one comprehensive handbook available that covers all four levels of the Jazz Guitar Performance Diplomas. The handbook contains examples of what to expect for the improvisation and rhythm playing components of the exams, as well as all the requirements for the Technical Knowledge component. Additional set books are also required for the prepared (Performance) component of the DipLCM, ALCM and LLCM exams; details of these set books are provided in the handbook. For more info on this exam, check out our series of lessons on How to Prepare for the RGT Jazz Guitar DipLCM Exam. The handbook details a range of scales, arpeggios and chords. The examiner will request the candidate to perform a selection of these from memory. The scales, arpeggios and chords detailed in the handbook have been selected to reflect the specific 5 diplomas requirements of jazz guitarists and include, for instance, some of the melodic minor modes and a number of ‘altered’ arpeggios and chords. The interval spellings for all the requirements are given and candidates can use their own preferred fingerings. The handbook details a short repertoire list of pieces, all of which are contained within one additional book. For this part of the exam, the candidate is required to perform two pieces, one of the pieces must be chosen from the repertoire list but the second piece can be a ‘free choice’ piece if preferred. The required repertoire piece must be performed with a backing CD that is supplied with the repertoire book. The free choice piece can be either unaccompanied or performed with a backing CD, so this presents candidates with an ideal opportunity to draw upon their own musical preferences and playing experiences within the jazz genre. For this component candidates are presented with a previously unseen chord progression. Candidates should then play the chords, improvising a rhythm part. The type of chords used for this section will be drawn from the Technical Knowledge section and there are example progressions contained within the handbook, one of which is reproduced below. For this section, candidates are presented with a previously unseen chord progression that is then played as a rhythm guitar backing track. Candidates should improvise a lead solo over the progression. The style of the guitar backing track may be drawn from a wide range of jazz styles such as early jazz, swing, cool jazz, bebop, hard bop, post bop,Latin, modern jazz, fusion, etc. As with the rhythm guitar playing section there are example progressions in the handbook, one of which is shown below. As you would expect in the jazz genre, there will be modulations and non-diatonic chords and the progression may be in any key. There are two parts to this section: firstly, the examiner will request the candidate to perform from memory a selection of scales and arpeggios; then candidates should perform from memory a solo arrangement of one of a selection of chord progressions that are displayed in the handbook. The structure of this section is similar to the performance section of the DipLCM exam although the choice of required pieces on the repertoire list is different. As with all sections of the ALCM, candidates will need to display a standard of playing beyond that expected at DipLCM level. As with the DipLCM exam, candidates improvise a rhythm part after having been presented with a previously unseen chord progression. As you would expect, the chord changes will be more frequent than at DipLCM level and a greater degree of stylistic interpretation and technical ability is expected. Again this section is set out along similar lines to the DipLCM although the chord progression may be slightly longer and will contain more non-diatonic chords and key changes. The handbook also contains examples of the type of chord progressions that candidates should expect to see for both this and the Rhythm Guitar Playing components. For this section of the exam candidates are required to perform a total of four pieces, at least one of which must be chosen from one of the set books that are listed in the handbook. The three remaining pieces can also be selected from the set books or, if preferred, can be ‘free choice’ pieces. Any free choice pieces can be self-composed or existing music and can be performed either unaccompanied or with a backing track that the candidate supplies. To give an indication of the standard of playing expected for this section, the handbook contains a list of recordings that features tracks from John McLaughlin, Martin Taylor, Mike Stern, Django Reinhardt, Pat Metheny and many others. Although the structure of this section of the exam is similar to the DipLCM and ALCM above, the chords that appear in the chart will appear simpler compared to the ALCM. However, candidates are expected to extend and embellish the basic chord symbols to produce a performance that is more creative and musically well-developed than would be expected at ALCM level. This section is set out along similar lines to that of the ALCM, although candidates should expect to be presented with more numerous key changes and non-diatonic chords to improvise over – as indicated by the example chart that is shown below. Note that the LLCM and FLCM Diplomas do not contain Technical Knowledge tests. By this level it is assumed that candidates will have a comprehensive knowledge of all appropriate scales, arpeggios and chords and will be able to demonstrate this in the practical performance sections detailed above. For this Diploma candidates should prepare and perform a varied programme of music of approximately 45 minutes duration. The programme can contain self-composed or existing pieces and should be performed either over backing tracks that the candidate supplies or with one or more accompanists supplied by the candidate. If preferred, up to 75% of the total performance may consist of solo unaccompanied pieces – so a great opportunity to perform some of those Joe Pass or Martin Taylor arrangements! The most important point to note for this Diploma is that this is the highest Diploma awarded by London College of Music Exams and is an equivalent qualification to a Masters Degree. Candidates are therefore expected to demonstrate a level of playing ability of the highest professional standard. As with LLCM, the handbook lists some pieces to indicate the standard of performance expected; these include Four On Six (Wes Montgomery), Oleo (Pat Martino), Teach Me Tonight (Martin Taylor) and Meteor (Tal Farlow). Candidates should also prepare and supply original programme notes that provide an in-depth harmonic and melodic analysis of the music performed. This is an exciting set of Diplomas that will develop the technical and musical skills of anyone with an interest in jazz guitar. As with the Electric Guitar Performance Diplomas, these are an excellent opportunity for self-development as well as a means to take the playing of your more advanced students to a new level. You can download the syllabus from the RGT Jazz Guitar Syllabus Page. This entry was posted in RGT Jazz Guitar Exams and tagged RGT Jazz Diploma Exams by Alan. Bookmark the permalink.